Some links provided may be affiliate links which, if clicked, can provide me with a small commission paid for by the product seller. To read my full disclosure policy click here. My hair has had its signature teal streak for over five years but to be completely honest I had wanted to do it several years before that. I can fully admit that I was scared. Scared it wouldn’t look as amazing as I imagined in my head, scared I would get “that look” from people, and honestly a little worried I was too old to be doing crazy hair colors. Finally, I got out of my own way, and my head, and just did the damn thing. I dyed it and honestly hated it the first time. I did it all wrong, trying streaks all over my head instead of just in the front – as well as it was COMPLETELY the wrong color. 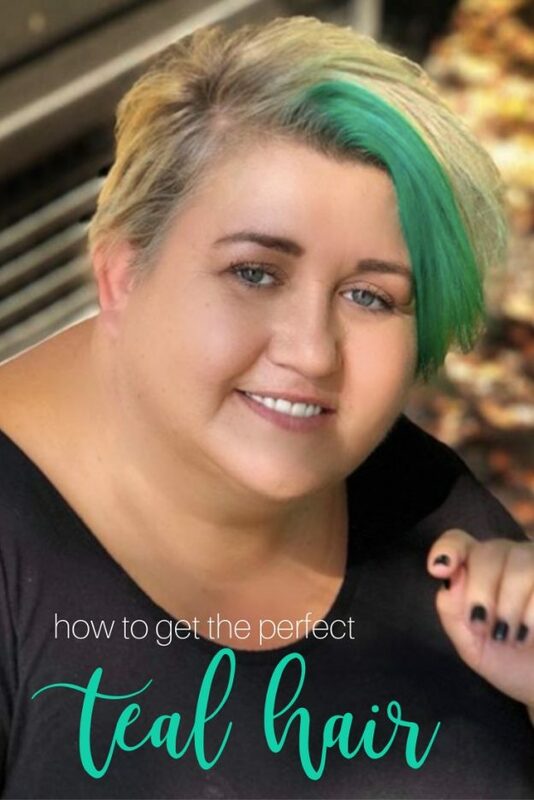 But after a little trial and error, I found that a single chunky streak up front combined with the perfect shade of teal hair was the magic combination and I’ve worn it that way ever since. One thing I quickly realized when I decided to go teal was that you can’t just buy teal. Can you believe that? It doesn’t exist. So me being a do it yourself kind of girl, I figured out a way to make the teal hair color I wanted. 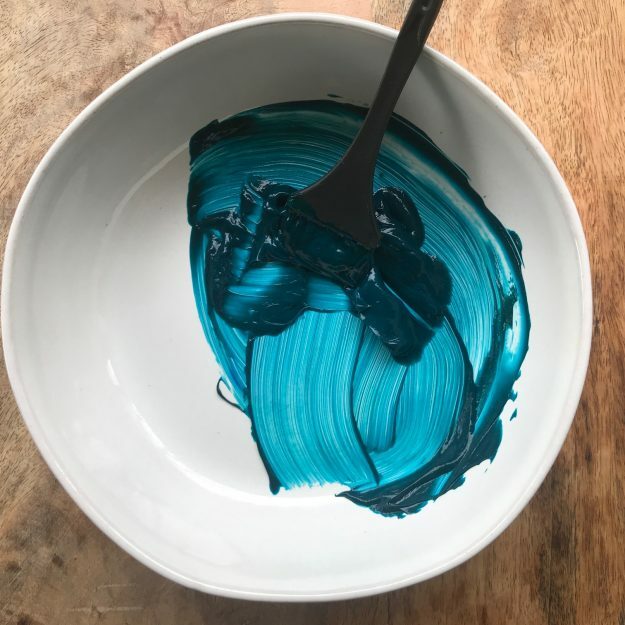 If you’re thinking back to grade school art class right now you might remember that teal can only be made with you mix two prime colors. 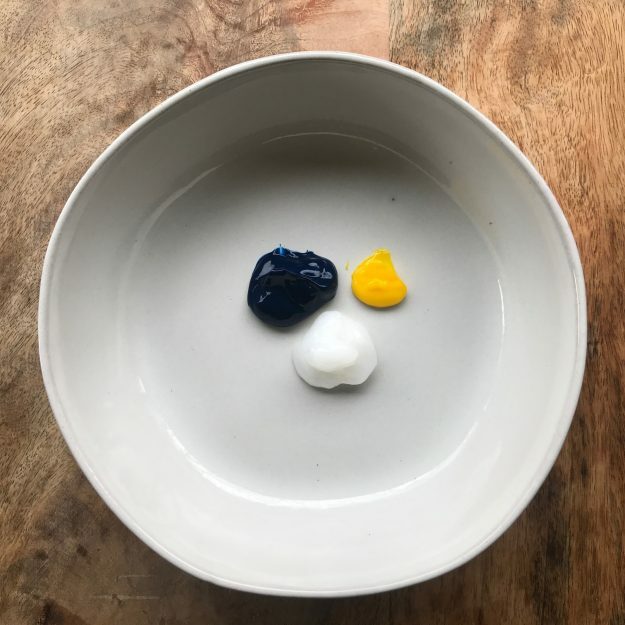 Yellow and Blue. The brightness and shade of teal you get will depend on how much yellow and blue you use. Please keep in mind that your natural hair color (or base color) will also affect the final result of your teal hair. I bleach my hair blonde, so the teal in my hair shows up brightly. If your hair is dark then the teal hair might turn out like a darker shade. The thing is to get true teal hair you need to start with almost white blonde hair. The final teal hair color you get greatly depends on the brand of hair dye you use. Just like with any product on the market, some brands are just better than others. And I’ve pretty much tried them all. The same is true when it comes to hair dye. I faithfully use Punky Colour. I’ve tried so many other brands (pretty much each and everyone on the market) and can tell you that Punky Colour lasts the longest and has the best tone to it. The blue is called Turquoise, and the yellow is called Bright Yellow. 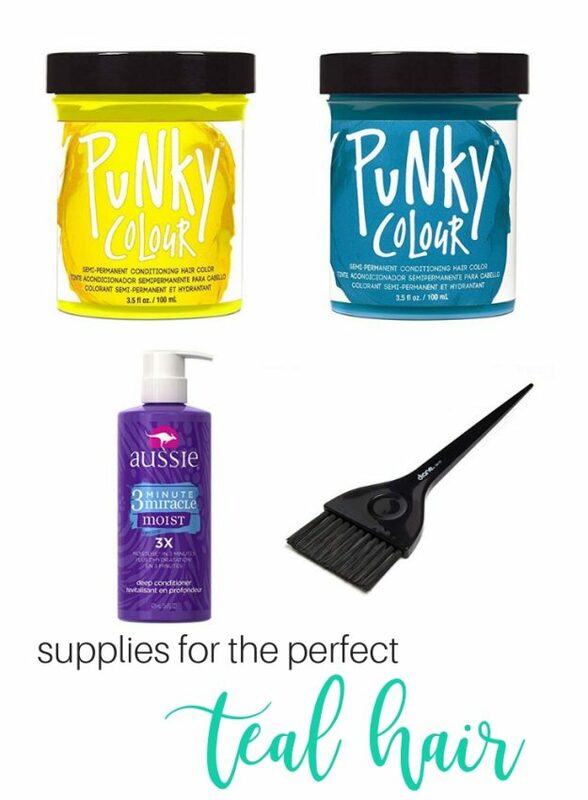 You will need to mix those colors with Aussie Three Minute Miracle, which is a pure white deep conditioning treatment. 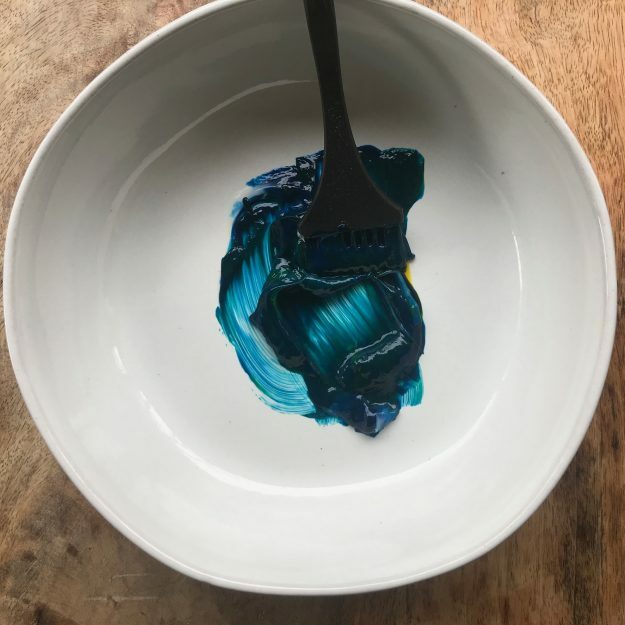 If you don’t add the conditioner, you’ll end up with a super dark version that will eventually fade to teal after a few washes, but the conditioner acts as a “pastel” to give you the perfect teal hair right away. You don’t want to use a conditioner that has any dye in it because this will keep your hair from getting damaged. Mix together well then apply to DRY hair, leave on 5-7 minutes then wash out. If you leave it in longer, the color will be darker. Shorter than that and it will wash out faster. Maintaining teal hair isn’t hard … but if you aren’t used to having to worry about it then it will probably take a little bit of adjustment. The first thing you should know is that you will never maintain your teal hair to NEVER fade grow out. Hair grows, and color fades. That is just as true for teal hair as it is for the bleach blonde hair you get from the salon. Semi-permanent color fades very quickly, and there is no permanent blue hair dye. It depends on how often you wash your hair. I wash my hair about every three days and the color lasts on average four to six weeks. The first time I wash it after it is dyed, I wash the stripe by itself, then put conditioner on it and leave it in. Then I wash the rest of my hair. Condition and rinse it all together. After that, I just wash and condition my hair altogether. Teal hair will fade into a light aqua to mint blue and will eventually all wash out if you don’t recolor it. I get this question a lot, but the funny thing is I only wear black and white clothes. So I don’t really have a great answer because everything I wear is usually black with some white mixed in. I personally feel like if you’re bold enough to wear teal hair then you are bold enough to wear whatever you want. Teal hair takes some moxie, and if you’ve got it, rock it!! Hello. I just read your post about covering your mobile home walls with bead board. How much did that cost you in total? How many panels did you end up using? Thanks. It was so long ago I do not remember how much it cost but you can check with Lowes or Home Depot and give them your measurements and they should be able to tell you exactly how much you would need and the cost. Good luck you will love the look!